The young couple wanted to buy a piano. They had $6000 in the bank, waiting to be spent. When a local piano store put up a huge banner saying, “inventory reduction — huge savings,” they knew their moment had come. With two young children in tow, they entered the large showroom and began browsing. There was only one other customer in the store and four or five sales people could be seen milling around. The couple tried to make eye contact with an employee but were unsuccessful. The sales people saw them, of course, but clearly thought this young couple was an unlikely prospect to purchase a quality piano — especially with two young children who might leave unsightly fingerprints all over the showroom. The couple walked the entire length of the showroom, looking at various models, without help. Finally, one employee acknowledged them and, from a distance, said “let me know if you see anything you like,” turned and walked away. The couple finally left in frustration, taking their $6,000 with them. What if, instead of ignoring this couple, the sales people had tackled them and launched into a high-pressure sales pitch? The couple would probably still have walked out, equally disenchanted with the store. So, what is the solution? How do companies and their representatives find a balance between over-bearing and under-serving — that elusive place where true customer service can be found? 1. Smile. A genuine smile means you are happy the customer is there and you are excited to provide them with exceptional service. It can make all of the difference in setting a positive tone. 2. Greeting. Ask, “How can I help You” and listen carefully. Customers will tell us how you can make them happy if we will just listen. 3. Focus on the Customer. Forget your problems, your commission, or your tired feet. Hone in on the customer’s needs and use your knowledge and creativity to help them solve their problems. Give them your full attention and help them get what they want. 4. Make it easy to do business with you. Go out of your way to make the process easy and pleasant. Never use high pressure. Never try to sell things they don’t want. Keep your store neat and organized. 5. Thank them. Express genuine appreciation for their visit to your store. Be gracious, whether they purchase or not. Treat people as if they were guests in your own home. Not only will they be more likely to return, but they will send their friends as well. All of these keys take work. None is convenient or automatic. But they will make a huge difference. Statistics show that a happy customer will tell three other people. Unfortunately, an unhappy customer will tell over 10. 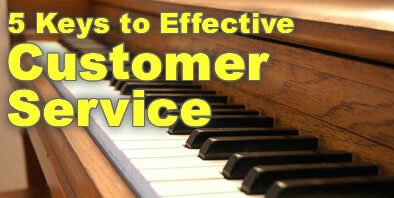 Exceptional customer service can make the difference between surviving and thriving in this competitive marketplace. I think #5 is an important aspect of customer service, showing genuine appreciation for their business makes it more likely that they will return. Your site has tons of information and resources on a wide range of effective customer service techniques and practices. I’ve had this happen to me, too, when I went to a store wanting to purchase something. With all this talk of a down economy, you’d think people would want my business. I think the biggest problem is not the economy, it’s poorly trained sales associates.